Newspaper Clipping – People’s Journal Saturday, October 21st 1939. 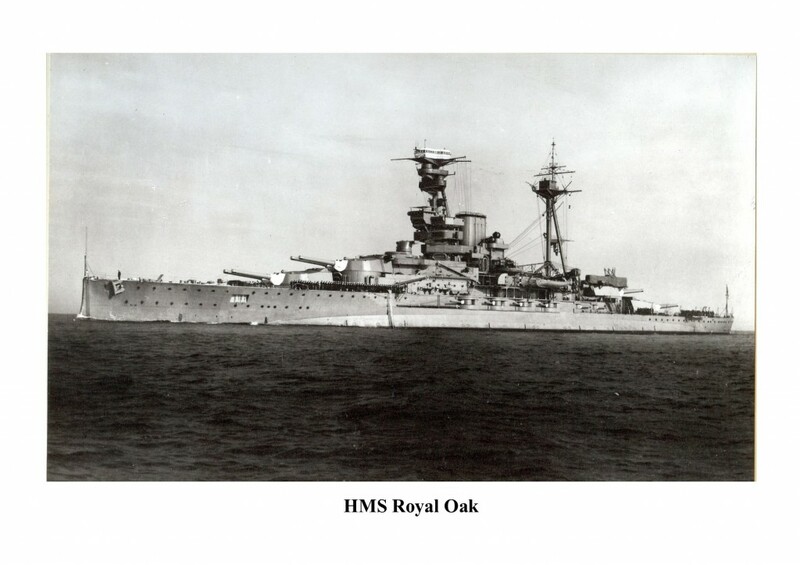 Inverness-Shire, Ross-Shire, Caithness and Orkney families suffered a severe blow with the skinning of H.M.S Royal Oak. 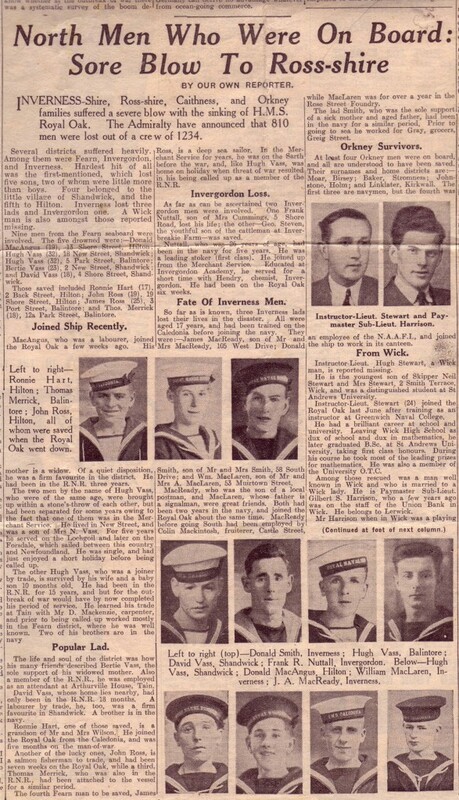 The admiralty have announced that 810 men were lost out of a crew of 1,234. “Several districts suffered heavily. Among them were Fearn, Invergordon and Inverness. 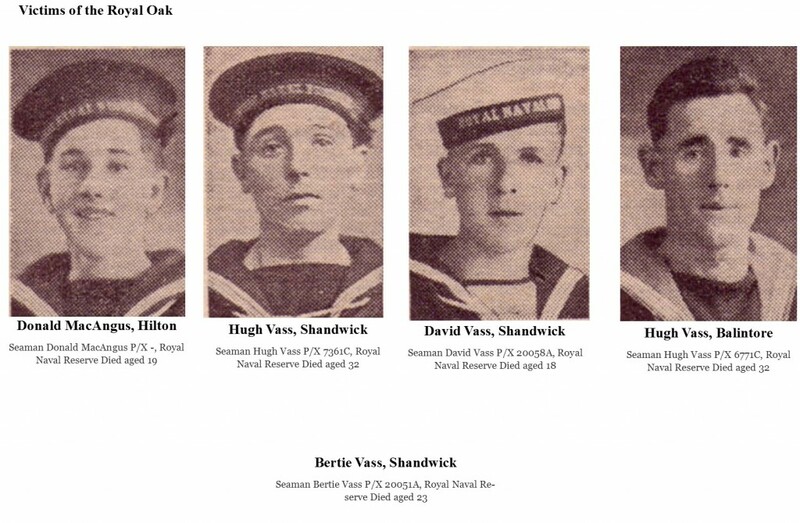 Hardest hit of all was the first-mentioned, which lost five sons, two of whom were little more than boys. Four belonged to the little village of Shandwick and the fifth to Hilton. Inverness lost three lads and Invergordon one. A Wick man s also amongst those reported missing. Donald MacAngus (19) 13 Shore Street, Hilton. Hugh Vass (32) 18 New Street, Hilton. Hugh Vass (32) 5 Park Street, Balintore. Bertie Vass (23) 2 New Street, Shandwick. David Vass (18) 4 Shore Street, Shandwick. Ronnie Hart (17) 2 Back Street, Hilton. John Ross (19) 19 Shore Street, Hilton. James Ross (25) 3 Port Street, Balintore. Thomas Merrick (18) 12a Park Street. MacAngus, who was a labourer, joined the Royal Oak a few weeks ago. His mother is a widow. Of quiet disposition, he was a firm favourite in the district. He has been in the R.N.R for three years. The two men by the name of Hugh Vass, who were of the same age, were brought up within a stone’s throw of each other, but has been separated for some years owing to the fact that one of them was in the Merchant Service. He lived in New Street and was a son of Mrs N.Vass. For five years he served on the Lochgoil and later on the Forsdale, which sailed between this country and Newfoundland. He was single and had just enjoyed a short holiday before being called up. The other Hugh Vass, who was a joiner by trade is survived by his wife and a baby son 10 months old. He had been in the R.N.R for 15 years but for the outbreak of war would have by now completed his period of service. He learned his trade at Tain with Mr D. MacKenzie, carpenter, and prior to being called up worked mostly in the Fearn district, where he was well known. Two of his brothers are in the navy. The life and soul of the district was how many of his friends described Bertie Vass, the sole supporter of his widowed mother. Also a member of the R.N.R he was employed as an attendant at Arthurville House, Tain. David Vass, whose home lies nearby, had only been in the R.N.R for 18 months. A labourer by trade he, too, was a firm favourite in Shandwick. A brother is still in the navy. Ronnie Hart, one of those saved, is a grandson of Mr and Mrs Wilson. He joined the Royal Oak from the Caledonian, and was on the man-of-war. Another of the lucky ones, John Ross, is a salmon fisherman to trade, and had been seven weeks on the Royal Oak, while a third Thomas Merrick, who was also in the R.N.R had been attached to the vessel for a similar period. 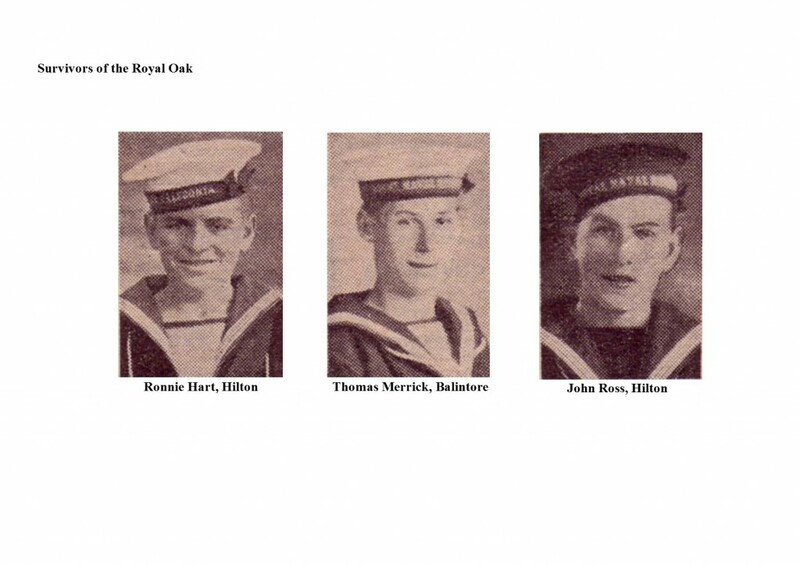 Read the memories of H.M.S Royal Oak survivor Ronnie McAngus Hart here.